Android phone is famous for running multiple applications at the same time, but it supports relatively few video formats (only supports H.263, H.264 AVC, MPEG-4 SP video format). So what if to play AVI, Xvid, DivX, MKV, WMV, RM, FLV, SWF, ASF, MPG, MOV, MPEG, HD, MTS, M2TS, and TS on Android phone like Samsung i7500, Samsung Galaxy, HTC Hero, HTC Legend, HTC Desire HD, HTC Wildfire, Motorola Droid, Motorola Flipout, Sony Ericsson Xperia X10, LG Ally and etc? 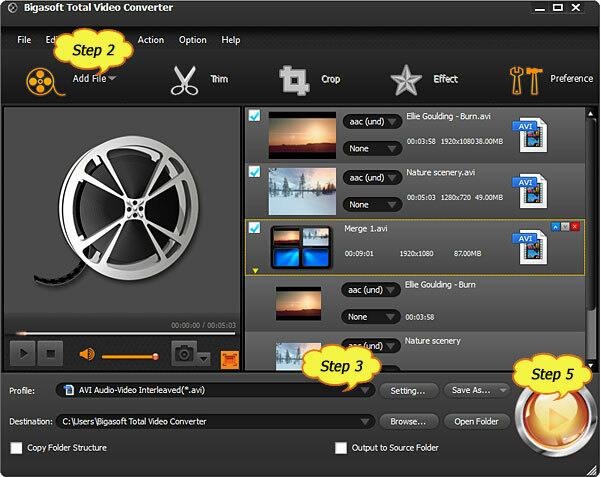 If fact, it is very easy to do it so long as you own the professional Android Converter-Bigasoft Total Video Converter. 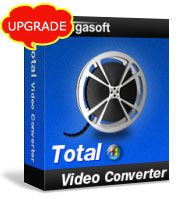 Bigasoft Total Video Converter, as a professional Android Converter, can easily convert video to Android supported format. No matter what video format you have like AVI, Xvid, DivX, MKV, WMV, RM, FLV, SWF, ASF, MPG, MOV, MTS, M2TS, and TS, the professional Android Video Converter is able to convert them to Android phone video format. Moreover, the ideal Android Converter also can serve as Android Audio Converter to convert any audio format to Android phone supported audio format or to extract audio from video and then save as Android phone supported audio format. The following is a step by step guide on how to convert video to Android phone format. This guide is also applied to converting audio to Android supported format. Free download the professional Android Converter - Bigasoft Total Video Converter (Windows Version , Mac Version ) install and run it. Click the "Add File" button to import your video which you want to play on Android phone. Or simply drag and drop video to the Android Converter. Click the drop-down button on the right side of the "Profile" button to select Android phone format like Gphone MPEG4 Video (*.mp4) . The ideal Android Converter also provides some advanced functions for you to edit your video before converting the video to Android phone format. "Preference" function is for you to set output effects, image type, CPU usage and action after conversion done. Click the "Start" button to finish convert video to Android format. Connect Android phone to your PC or Mac, then transfer the converted video to Android phone. Android is a mobile operating system initially developed by Android Inc., a firm purchased by Google in 2005. Android is an open source mobile phone platform based on the Linux operating system. As a flagship participant in the Open Handset Alliance (OHA), Android operating system can be installed by all the members from the Open Handset Alliance including Google, HTC, Dell, Intel, Motorola, Qualcomm, Texas Instruments, Samsung, LG, T-Mobile, Nvidia, and Wind River Systems and more. Android phones refer to phones that use Android as a mobile operating system including HTC, Samsung, Motorola, LG, Sony Ericsson, Acer Inc, Garmin, HKC, Dell, Huawei, Lenovo, Pantech and more. Usually, Android phones support H.263, H.264 (in 3GP or MP4 container), and MPEG-4 SP video format. If you want to play AVI, Xvid, DivX, MKV, WMV, RM, FLV, SWF, ASF, MPG, MOV, MPEG, MPG, HD, MTS, M2TS, TS in Android phone, you need to convert them to Android phone format like MP4, 3GP. Android phone includes various phone models, and different phone model has its specific features. But they also have common features which make Android phone more competitive. Android phone can run multiple apps at the same time whether they are system apps or apps from the Android Marketplace. At this respect, Android phone is even more competitive than iPhone OS which does offer limited multitasking, but only allows native applications such as Mail, iPod and Phone to run in the background.